The fixture planners had thrown up an interesting new year Surrey treble for second placed Chobham. 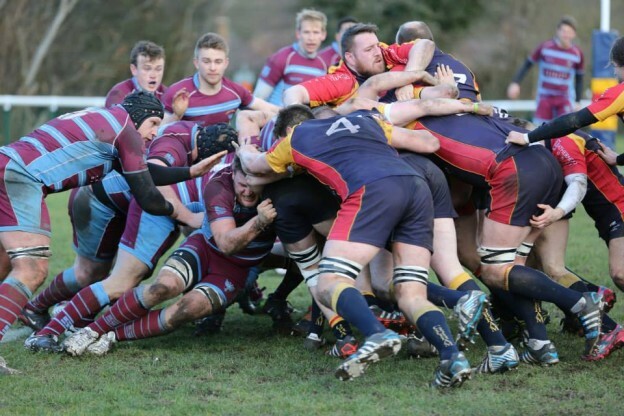 First up at the end of January was in form Guildford who were seen off at Broadwater by the men from Fowler’s Wells who then entertained another local team, Cobham. They too went away empty handed as Chob extended their unbeaten run to nine. So it was significant that the third leg involved second v first as Chob hosted table toppers Wimbledon at Fowler’s Wells. With W’s securing a very convincing win in October against a below par Chob they had now established a 7 point lead and looked very much a team in form. 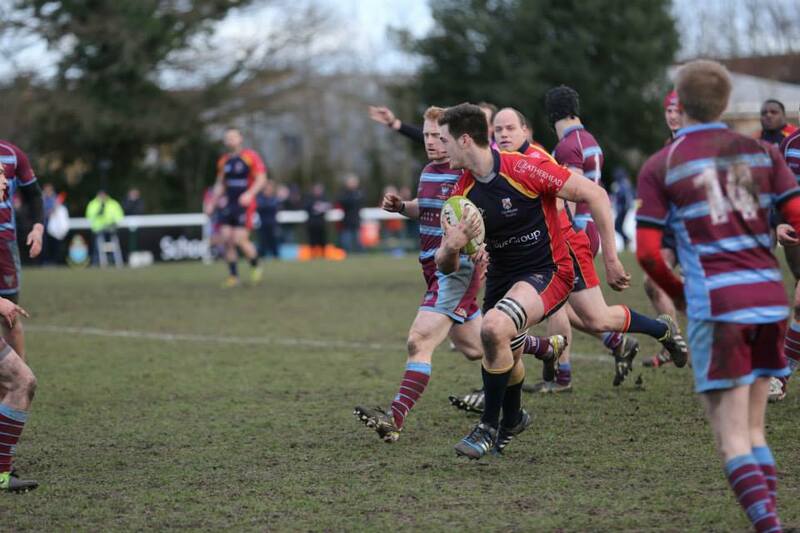 However Chob were going quietly about their business with a string of impressive wins and had moved into second spot, so the rugby aficionados would have known that this was the weekend game to watch. The national press had done their bit too profiling Wimbledon’s head coach and England’s oldest try scorer Nick Easter as a man enjoying his involvement in grass roots rugby. As a result the home touchline was three deep as the ever faithful “Chobham Army” came to play their part in the afternoon’s proceedings. The week’s recess had allowed the injuries to props Sonny Kuwana and Lee Evans to clear and both returned to the front row with the coaching team of Ryan Gregory and Tony Paul otherwise able to name an unchanged line up. Wimbledon included Chob old boy Mike Wood in the pack up as well as the experienced Lorne Ward who spent several seasons with Bath and Harlequins. A bright day, cooled by a chilly breeze blowing down the pitch greeted the players with the surface in good condition despite the recent rain. Chob started brightly with Ollie Smith looking lively but were forced into a change as early as 5 minutes when wing Aaran Mawson suffered a facial injury and had to be replaced by Callum Edwards. This didn’t seem to trouble the home side as the two league heavy weights sparred with each other either side of the half way line. With both sides contesting the lineout strongly, neither was able to secure an offensive platform. However on 15 minutes Chob took first blood winning a scrum penalty which was then marched 10 metres forward for back chat to referee Mr Venables. 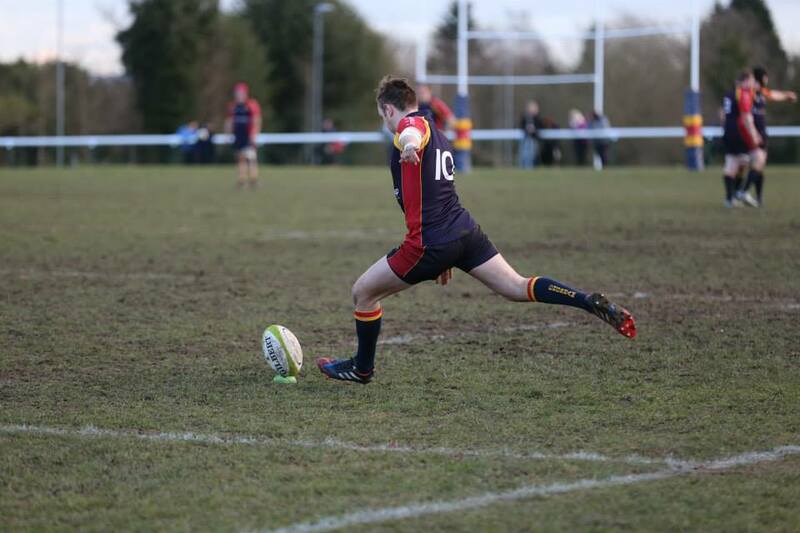 Fly half Alex Seers bisected the posts. Chobham 3 Wimbledon 0. The lead increased straight from the kick off. Wimbledon having taken the restart lost possession and wing Josh Devitt reacted quickest to the loose ball. Although he was caught just before the try line, giant lock Dom Sammut showing great athleticism, took a wonderful offload to score the try. Seers’ touchline conversion was just wide. Chobham 8 Wimbledon 0. Chob now looked to step up and with a helpful wind at his back Seers probed the Wimbledon defence with a series of raking touch finders. With play now in the away 22, the Chob squeeze came on in the set piece. With the scrum starting to dominate and the driven line out functioning, Chob drew a penalty on 23 minutes which Seers knocked over. Chobham 11 Wimbledon 0. Five minutes later, a wonderful turnover by back rower Euan Buckland gave Seers another opportunity to add to the score which he duly did. Chobham 14 Wimbledon 0. The half-finished with Wimbledon’s Neil Hallett reducing the arrears only for Seers to extend it as we began to see a duel of the highest calibre from both place kickers. Chobham 14 Wimbledon 3. Half time. The Chobham coaching team would have been delighted with the first half performance. With Kuwana, Adam Blemings and Evans delivering a secure set piece and Paul and James Dunne marshalling the muscular charges of Ti Pairima-Lewington, the lead was well deserved. A further 40 minutes of control was required to secure victory. It was clear to the crowd that the visitors were not sitting at the top of by accident and that the next series of scores could be crucial. In fact Chobham got off to a very sloppy start to the second half. With the restart not being gathered Wimbledon were given the opportunity to use possession to gain field position and with the attendant opportunity of points. With the wind at his back, fly half Bryan Croke started to become more influential and the visitors found the intensity that had perhaps been lacking in their play in the first half. With the back row of the Taits and May being prominent, Chob suddenly looked less assured and as a result fell foul of Mr Venables’ view of the break down. By minute 50, the unerringly accurate Hallett had knocked over 3 penalties to reduce the deficit to two points. Chobham 14 Wimbledon 12. Chob needed a foothold which came on 52 minutes. A defensive lineout deep in the Wimbledon 22 was overthrown and snaffled by Smith who bundled his way over for the try. Seers made the tricky conversion look easy. Chobham 21 Wimbledon 12. Then came three minutes of potentially pivotal action. First Chobham produced a wonderful turn over which created a great counter opportunity, but the ball was taken into contact and W’s secured a penalty which unsurprisingly the unerring Hallett converted. Chobham 21 Wimbledon 15. Immediately from the restart an over exuberant Devitt challenged an airborne Wimbledon player for the restart and was correctly shown yellow by Mr Venables. Hallett missed a three point opportunity but it didn’t matter as the clever Croke sensed space from the numerical supremacy and with a jink moved through the home defence before the ball found right wing Neil Brown who raced in for the try out wide. No extras. Chobham 21 Wimbledon 20. On 72 minutes Hallett knocked over his sixth penalty and for the first time in the match Wimbledon nosed ahead. Chobham 21 Wimbledon 23. But this Chobham side is made of sterner stuff and with Seers sending a laser guided kick deep into the Wimbledon red zone the scene was set. As the lineout formed the Chobham crowd’s roar went up and with the ball taken and the maul perfectly set, the Chobham pack drove over the try line and it was fitting that Gregory who had been immense in his leadership all afternoon should emerge with the ball. Seers made another tricky kick look easy and the scoreboard read Chobham 28 Wimbledon 23. With the home team repulsing Wimbledon’s last effort, Mr Venables blew for full time. 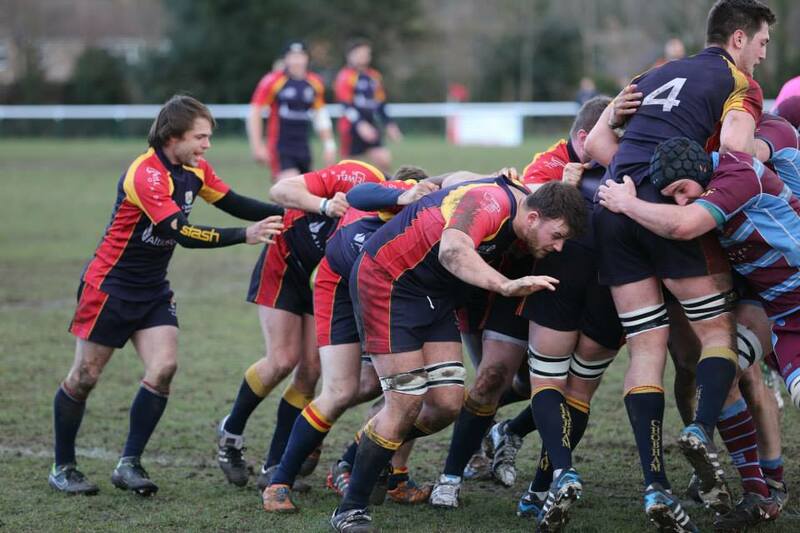 Chobham 28 Wimbledon 23. This was a high quality encounter befitting the fixture. On show were two high class place kickers ready to punish any transgression and two teams looking to play adventurous rugby. On the day Chob deserved their victory with a 3-1 try count confirming this. Wimbledon still hold a slender 4 point advantage with Chob on a 10 match winning streak, breathing down their necks. With 6 games to go this promotion battle will go right to the wire. 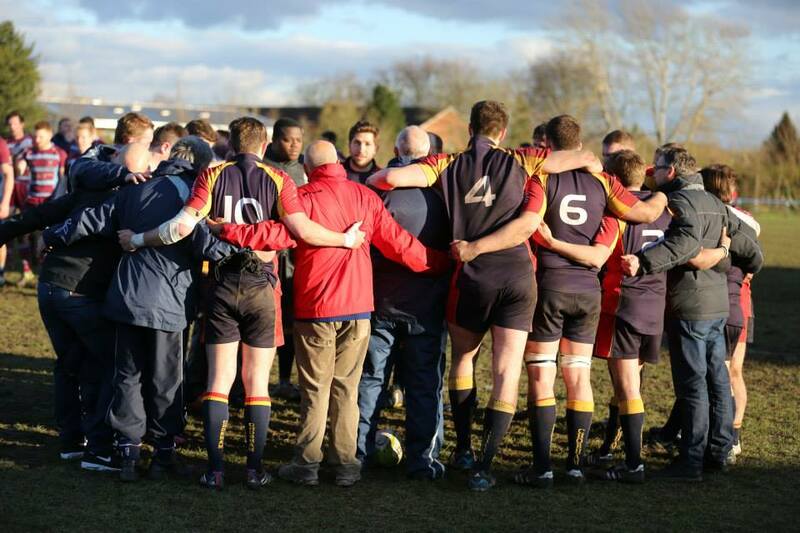 With Chobham 2’s also beating Wimbledon 2’s by a single point, the post-match celebrations were enjoyed to the full. It was good to see 19 year old Aaran Mawson back having been stitched up at St Peter’s and also Wimbledon’s Jack Fishwick. Well known to players from both sides, Jack is showing an inspirational approach to his recovery from a very serious injury suffered last season and the spirit of rugby was well and truly alive at Fowler’s Wells on Saturday.